In my post about Glossier's Phase 1 Set (here), I mentioned that I loved the products so much that I couldn't resist ordering their newly-released face masks. I've been testing them for a couple weeks now, and I couldn't be happier with them. Glossier has recently released two masks, designed to work in harmony together. The Mega Greens Galaxy Pack is meant to detoxify and balance the skin, with Glossier referring to it as a "juice cleanse for your face." The Moisturizing Moon Mask is designed to replenish and nourish the skin, with added ingredients to brighten the complexion as well. I'm always wary of detoxifying/purifying masks because of my sensitive skin. I usually can't use them on my cheeks without them getting red and irritated, so I have to reserve them for use only on my nose, chin, and center of my forehead. But the Mega Greens Galaxy Pack is gentle enough that I feel comfortable using it on my whole face - a nice change, because I've realized my cheeks were getting congested too! It's a clay mask, which are known for being stripping and drying, but they use the gentlest form, white kaolin clay. It also contains leafy greens like spinach and parsley to help purify and protect, and avocado oil and aloe to condition the skin. I find it's the perfect balance to draw out impurities in my skin without stripping it at all. The Moisturizing Moon Mask has the consistency of a thick, wobbly cream - it feels similar to The Body Shop Vitamin E Sink-in Moisture Mask. I like to spread this on in a thin layer and almost rub it in before leaving it for the suggested 20 minutes. The first time I used this, I was really surprised at how cooling it was - it's so cooling that I actually mistook the sensation for burning at first. But my skin shows no irritation whatsoever after use. After the initial shock of how cold it is, it feels amazing and the gentle tingling sensation is actually so relaxing - this mask could put me to sleep. The mask is packed with hydrating ingredients like hyaluronic acid, plant-derived squalene, honey, and aloe - totally perfect for my dried out winter skin. Along with the hydrators, it also has licorice root and lemon extract, along with Glossier's oxygenating agent, to leave you with brighter, glowing skin. It really does do all it claims - after washing it off, I'm left with plumped, radiant skin. Glossier suggests using the masks one after the other (in the order I've mentioned them), for 20 minutes each. I tend to use them once a week, and it's become my Friday afternoon ritual when I come home from work. They're the perfect combo to cleanse and de-stress my tired skin, and I pretty much look forward to my mask time all week long (sometimes I sneak another 40 minutes in mid-week if I really need it). They work so well together that I don't think I could pick a favorite. After the success of the Phase 1 Set, Glossier has not disappointed. 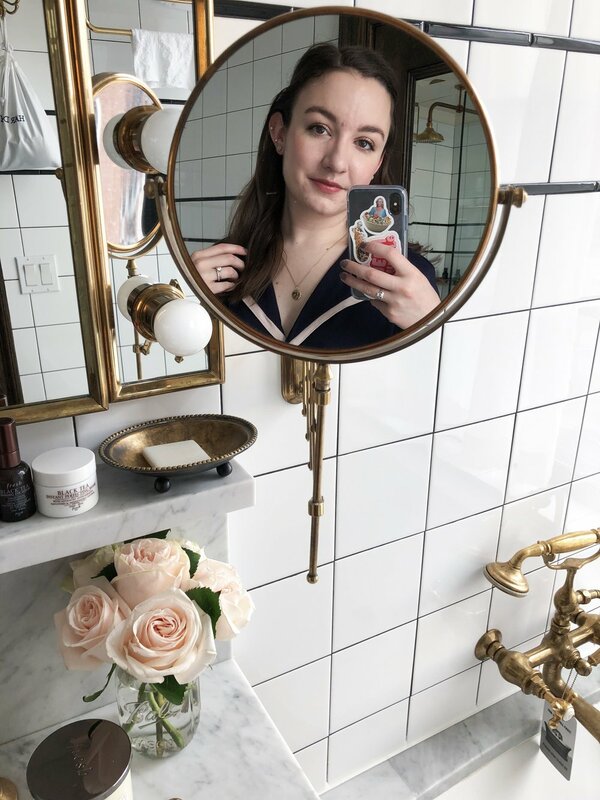 These masks have become a staple in my skincare routine, and my skin looks and feels its best when I've been using all of the Glossier products. Have you tried or would you try these masks?